How I spend my weekends. I've got it down to an art. I’m a married professional, a homeowner, a father and a taxpayer. In my life, I’ve received three tickets – two for speeding (both in Carrollton, about 10 years apart) and one in Douglasville for an expired tag (my Oldsmobile couldn’t pass emissions). In my spare time – what time I have – I enjoy taking my dirt bike to the hills over the city, turning up the old country music and riding ‘till dawn. I also enjoy ripping off fancy cars and blowing down busy streets as quickly as I can (usually I drive in oncoming traffic, because it’s easier somehow to see the cars coming at you than the one’s you’re gaining on from the rear). There’s also this guy I steal cars for sometimes to make a little extra money. I use it to support my grenade-and-ammunition habit. Oh, and I kill hookers. Sometimes before, sometimes after, sometimes for refusing to get in the damned car. I’ve shot ‘em, stabbed ‘em, ran ‘em down and hacked ‘em to bits with a samurai sword. I’ve bludgeoned them to death with baseball bats and golf clubs. It’s great fun. Sometimes, my wife helps. She’s the one who taught me how to do it. That game still holds a special place in our hearts. We’d spend weekends holed-up in our apartment, checking off missions and opening more of the game. I navigated, reading the walk-throughs from the game guide I’d purchased while Ashley sliced paths of destruction across the deserts outside faux-Vegas, leapt hills in faux-Frisco and thumbed gang bangers in faux-L.A. We’d order pizza and burn through our cache of soda, fueling the fictional bloodshed. 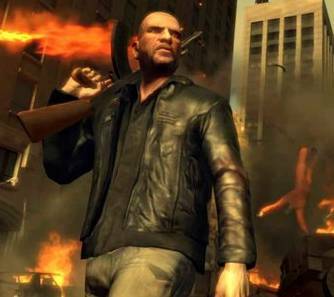 The Grand Theft Auto games and others have been much maligned for their graphic depictions of violence. In the latest one – “Grand Theft Auto IV” – the characters routinely frequent strip clubs, and you can pay extra for a lap dance. It’s not completely indecent, though – the stripper does wear pasties. It makes sense that these are games that are not suitable for young audiences. California agreed, going so far as to make it illegal to sell these games to young people. When California passed the law, my reaction was, “Eh,” followed by a shrug. California has a year-round legislature, and it’s purpose is to make up laws. If it didn’t do that, it wouldn’t need to exist. And though California is a very large market for video games, it’s, like, all the way over there, man. If you want to fully appreciate how damned far away California really is, try driving there sometimes. Half-way across Texas is when I started having my reservations about continuing. Also, I’m not much of a “gamer.” I’d like to be – I find video games fascinating. But I have a job, a family and a mortgage. There’s precious little time or money for video games. The idea of dropping a half-grand plus on a new gaming system leaves a lump in my throat that I simply cannot swallow. But it was heartening to hear that my appreciation for the utter art that goes into these games is not lost on the highest court in the land. Last week, the Supreme Court of the United States put the brakes on California’s ban, effectively elevating video games to enjoy the same First Amendment protection as books, plays and films. In the 7-2 decision, the Court has placed the regulation of video games out of reach of the state and into the place where it seems most logical: the home. Now, this doesn’t affect the rights of retail chains to decide that they will not carry certain titles or game ratings; though if they do, they will not be subject to prosecution for selling such games to minors. The case was Brown v. Entertainment Merchants Association, and while it does apply only to the California statute, the effects liberate video game designers from the bonds that force them to consider content when planning games, enabling them to use a much broader platform for their narratives. I continue to adhere to my belief that violent video games do not lead to violent behavior, but that only applies to an audience who knows the difference between fiction and real life. Those who do not know the difference ought not to have access to these games. Whether or not an individual is mature enough to handle these games, however, is more accurately decided by one’s parents; not the year-round California legislature.